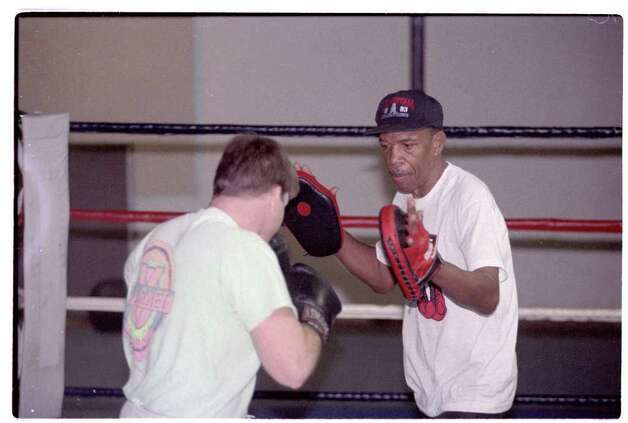 Timothy Goodall Jr., who spent decades as a boxing coach in Houston, died Tuesday. He was 78. Goodall travelled the world, helping develop hundreds of professional fighters and championship boxers, including two-time national champion Juan Diaz, over his long career. His most cherished accomplishments was working with and advocating for young men in the community, said Corlis Goodall, his wife of 20 years. Timothy Goodall Jr., trains boxer Tim Curtis at Main Street Gym in 1994. The Beaumont native spent more than four decades as a trainer. "He was very much in love with the children," she said. "He touched a whole lot of young men's lives in the Third Ward." Born in Beaumont on Aug. 15, 1933, Goodall attended Jack Yates High School. He worked as a carpenter and plumber before finding a way to earn his living in the ring. He spent more than four decades as a trainer, working the longest at the Savannah Boxing Club on Houston's south side. The amateur boxing club was designed to keep young men off the streets. Goodall's work took him around the globe, including matches in Italy, Aruba, Japan and Australia. In 1991, the Houston Regional Golden Gloves Tournament presented him the Lou Padula Award for continued service to the sport of amateur boxing. It was at a fight in Oklahoma, where he later moved, where he met Corlis Pearson, who became his wife. He is also survived by daughter Brandy Grant and grandson Brayden Grant, as well as a lots of in-laws, nieces, nephews and cousins. Services will be at 1 p.m. Jan. 14 at the Crown Hill Cemetery and Funeral Home in Tulsa, OK.
By the time Timothy Goodall Jr. fitted them for their first boxing gloves, life had thrown a few hooks and jabs their way. Timothy Goodall Jr.:The longtime Houston boxing trainer, who had lived and coached in Tulsa for the last 15 years - most notably for Tulsa fighter Mikey Burnett - discovered that boxing was a good vehicle for helping steer troubled youths straight. Goodall, who worked with hundreds of amateur and professional boxers during his 40 years as a trainer, died Jan. 3. He was 78. Often, they had fought back with a few of their own. But Goodall was sympathetic to any baggage that the youths he trained brought with them into the ring. He had been there. "I was a problem kid," Goodall told the Tulsa World in 2001. "But when I was about 12 or 13 and skipping school one day, I saw a youth program and went inside. They were teaching boxing. I've been involved in boxing ever since." The longtime Houston boxing trainer, who had lived and coached in Tulsa for the last 15 years - most notably for Tulsa fighter Mikey Burnett - discovered that boxing was a good vehicle for helping steer troubled youths straight. With the training, it was easy to mix in life lessons. "I know what it's like to get kids off the street and give them something positive to do. ... No one will go out that door without a positive attitude," Goodall said. Goodall, who worked with hundreds of amateur and professional boxers during his 40 years as a trainer, died Jan. 3. He was 78. A funeral service is set for 1 p.m. Saturday at Crown Hill Funeral Home Chapel. Burnett was training by himself one Sunday morning when an unexpected visitor dropped in. "This guy walks into my gym," Burnett said. "He had seen me from the street, and he comes in and says to me, 'Look at this kid - in here working out on his own, trying to make something of himself.' "
The man introduced himself as Timothy Goodall, and the two began talking. It was the beginning of a great relationship. A Beaumont, Texas, native who moved to Tulsa in 1995, Goodall had enjoyed a long career as a trainer. Traveling the world over four decades, he had worked with many top fighters, including two-time national champion Juan Diaz. Burnett was already a nationally known mixed martial artist, but Goodall helped him get into boxing. Beyond the boxing, though, he taught him something else, Burnett said: how to live. "He taught me about what's really important in life," Burnett said. "The fighting business is a rough game, and when you're a fighter you think that's the important thing. But it's not - it's about family, about being a good man and a good father. That's what Tim taught me. "He was a special, special person to so many people. I had a good father, but Tim became like a grandfather to me." At Burnett's gym, the two teamed up to teach boxing to youths, just like Goodall had done for years in Houston's Third Ward. Burnett said he now tries to pass on the same lessons in life and fighting to the students he works with. Goodall first came to Tulsa in 1994. One of his boxers, Sherman Griffin, was fighting Tommy Morrison at the Brady Theater. While in town, Goodall would find a good reason to come back. Corlis Pearson had just gotten off work when Goodall, who was walking around the Brady District, stopped to ask her for directions. A romance was sparked. Goodall moved to Tulsa the next year, and the two married. When he worked with youths, Goodall emphasized self-confidence and personal responsibility, his wife said. "He loved the sport, and he loved kids, and he wanted to do what he could to keep them on the right path. He was that kind of man," she said. Goodall's survivors include his wife, Corlis Goodall; a daughter, Brandy Grant; and one grandson.